When we moved in 7 years ago, the deck was one of my favorite features of the home. The traditional lines, large size, and beautiful staircase were striking. The only problem, were the trees that covered it. The droppings, shade, and just over growth in general, were over powering this beautiful cedar deck. So, the first thing we did, was cut back the trees. This helped, but over the years the wood still began to rot from not being treated. The bones were good, but we had a lot of work to do to get it in good shape again. So, yes…this makeover was a ton of work. In fact it took us 2 Summers to complete. However, what I’m really happy to tell you, is that we used some amazing products. The hard part was replacing all of the rotted wood. The easy part was using Thompson’s WaterSeal Products to not only protect the new wood, but to give the old wood new life. This post does not focus on wood replacement. My husband did that part and to be very honest, I have no idea how he did it. The measuring, the cutting, the intense labor, the wasp stings…it’s not for the faint at heart. He did not replace all of the wood, but approximately 30% is new wood. When it comes to the “cleaning the new/old wood” part, and then “staining that wood”, I got you covered. Here’s the deck before. We had tried another brand of stain last Summer, even before we had replaced the rotted wood, but it didn’t make any of the wood look warm, and pretty like we wanted. It made it look very uneven, and grey. I’m happy to say that this is how the deck looks now! It looks so good, that we had an impromptu pizza party last weekend! Here’s my husband replacing the rotted wood before we cleaned off the old stain. 1. Blow or sweep off all leaves and debris. 2. 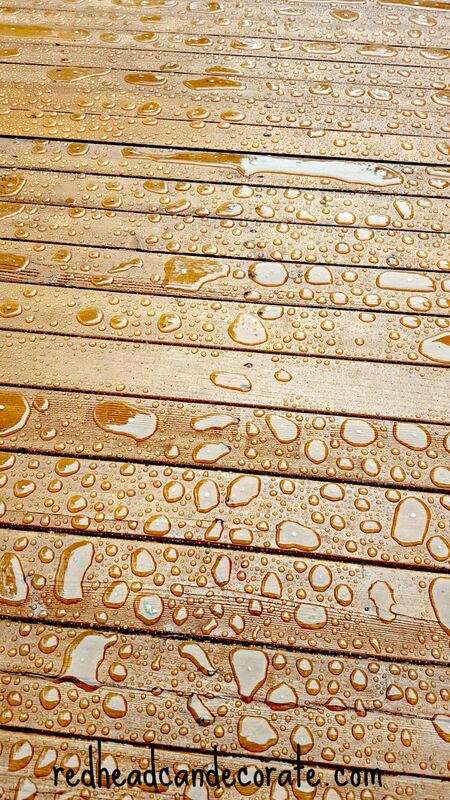 Spray surface of deck with water until it is saturated. 3. 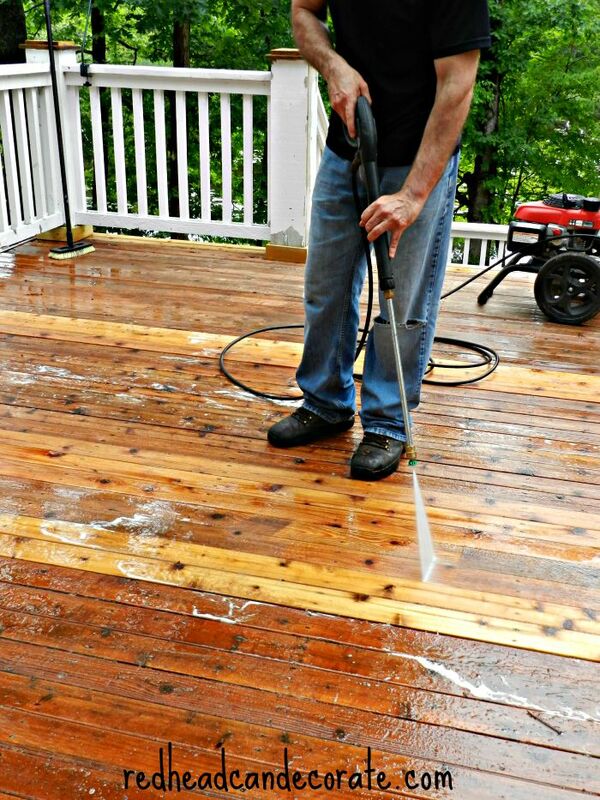 Using a pump sprayer, spray the deck with Thompson’s WaterSeal Heavy Duty Deck Cleaner until it is evenly coated. Let sit for 15 minutes. Be sure to mist it with water during the 15 minutes so it doesn’t dry. 4. Power wash that baby. Find Thompson’s Heavy Duty Deck Cleaner here. Maybe not right away, but after about 24-48 hours you can stain it! 1. Shake the cans and combine into a 5 gallon bucket. That ensures one uniform color. 2. Use a good quality staining brush to brush it on heavily and evenly making sure it doesn’t pool. 3. If one coat doesn’t do it for you color wise, you can use *another coat. That’s what we did. *If you decide to do 2 coats, when you brush it on, you may notice beads. Keep brushing through until it soaks into the first coat. Find Thompson’s Waterproofing Wood Stain(s) here (this is what we used). Wow, just look at that water protection. The last thing we had to do, was paint our railings with white stain. So, here we are. At the end. We couldn’t be happier with the results. 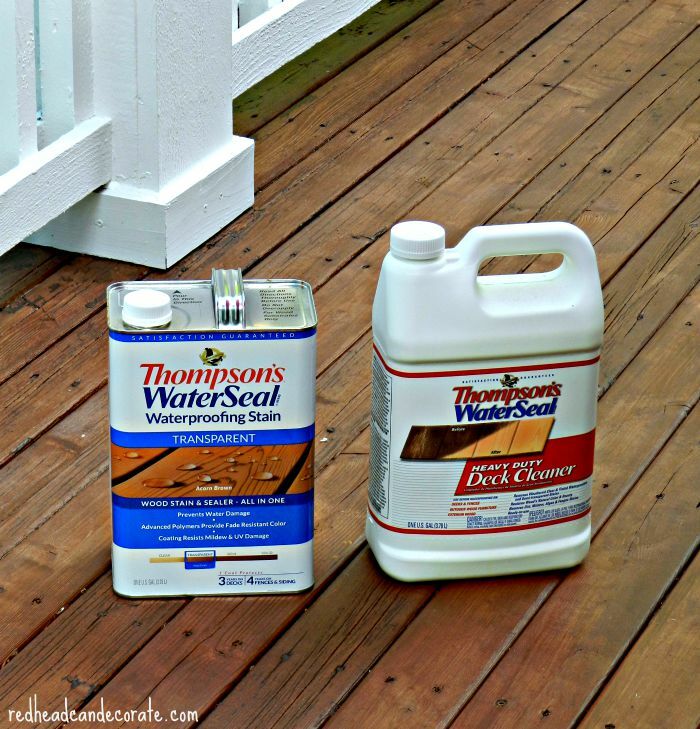 Prize Package: Thompson’s WaterSeal Heavy Duty Deck Cleaner (4 gallons) & Thompson’s WaterSeal Waterproofing Stain (4 gallons). Who: 3 random winners will be chosen by the Rafflecopter on July 31st. You must be 18 years of age and reside in the US (prize will be shipped in US only). Our deck is in serious need of a makeover, and I’d love to use this on it! 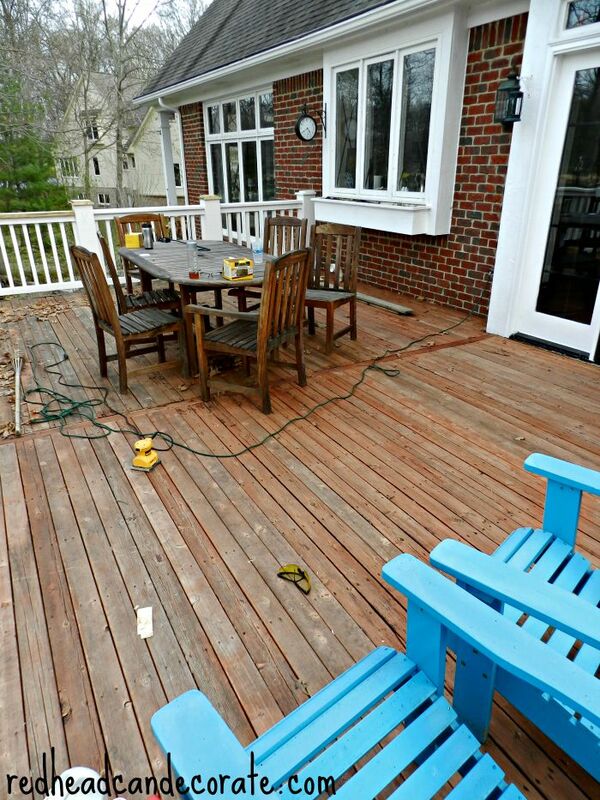 Julie, your deck turned out beautiful! Thank you, Julie!! Good luck!! Your deck looks beautiful! I definitely would love some Thompsons to make over my deck! Thank you, Shanna, good luck!! 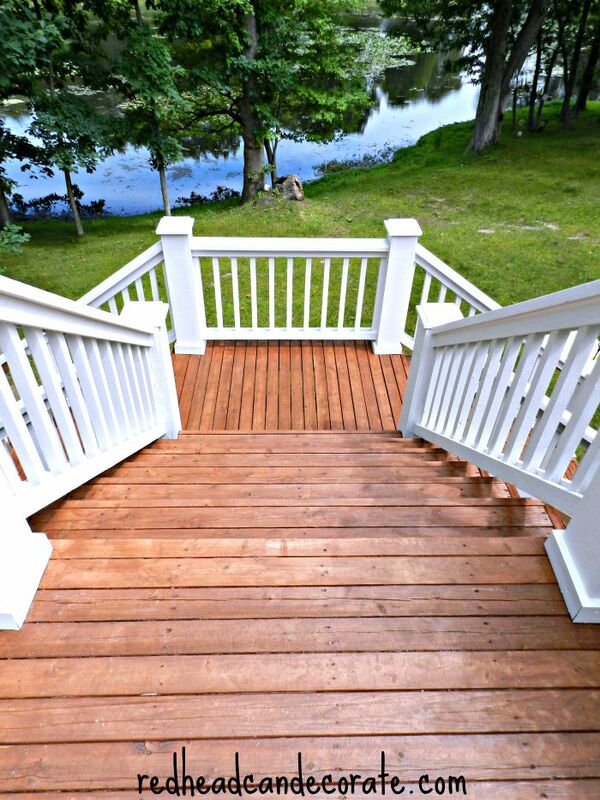 your deck is so pretty, I love how new everything looks with that awesome deck cleaner and seal! You have such a pretty property looking over the water! Wow, Julie, it turned out so beautiful! What an amazing difference. Definitely worth the time and effort. We don’t have a deck but I use similar boards for my photography backdrops and they are in serious need of refinishing. Julie, WOW! That deck looks amazing now. The stairs are just stunning! 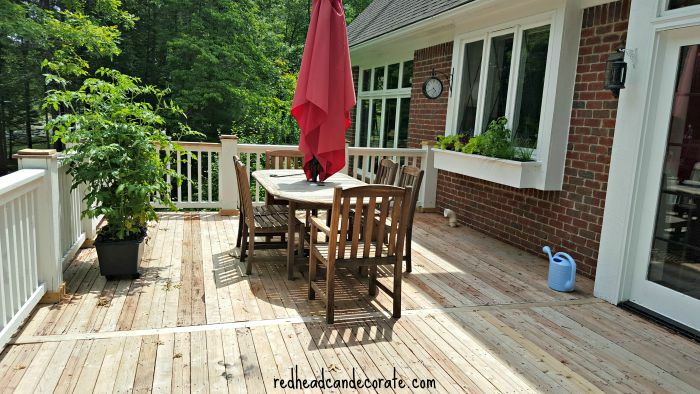 Your deck looks absolutely amazing, Julie! The right product can make a world of difference (plus a lot of hard work with the replacement aspect of it!). Such an inspiration. I follow your page and am amazed at how beautiful your deck looks now. We have a large deck on the back of our house, which faces west, in North Florida. Needless to say the sun plays havoc with it every year, so we could use the Thompson products!! My mother’s actually needs refinishing, this would be great for it and save her money! 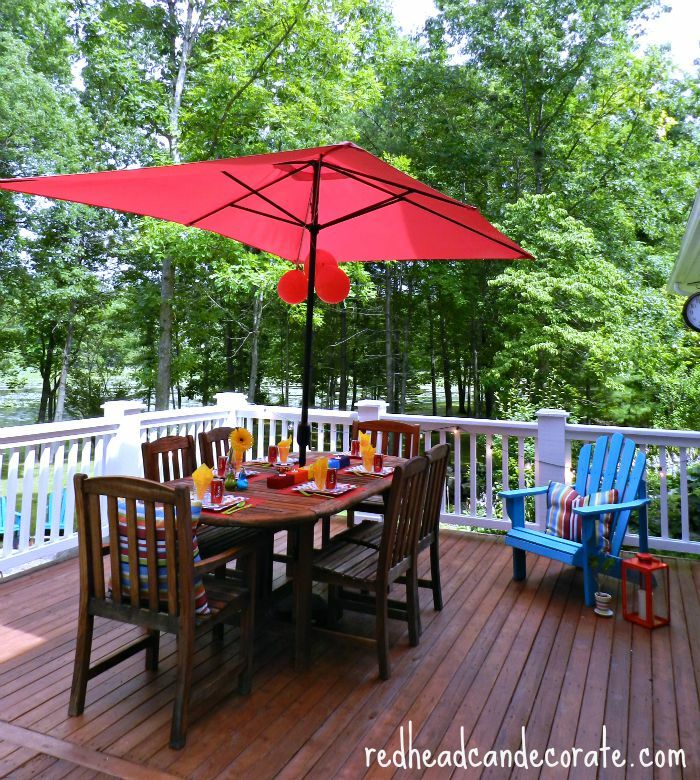 Your deck is gorgeous Julie! You can tell a lot of work went into this project and it paid off! I will try the new Thompsons Water Seal in the spray form on some antique wood pieces I use in the summer . I am so excited about this great way to preserve my treasures AND my deck ! I did this to my old house deck and it looked new when I finished. We’ve been in our new house for 3 years now and its time to do it here. It looks fantastic Julie! All that hard work paid off. What a happy place to enjoy your beautiful view! Where have u been sister??? Thank you!! We just built a huge deck and this would be very welcome when are ready to seal it. Very timely! Wow, looks fantastic. I have a two leveled deck we need to clean and stain. It sure is a lot of work! Hopefully soon. Looks awesome! Ours is in need of some help! Your deck looks amazing! Our decks need a lot of help. It would be so great to win! 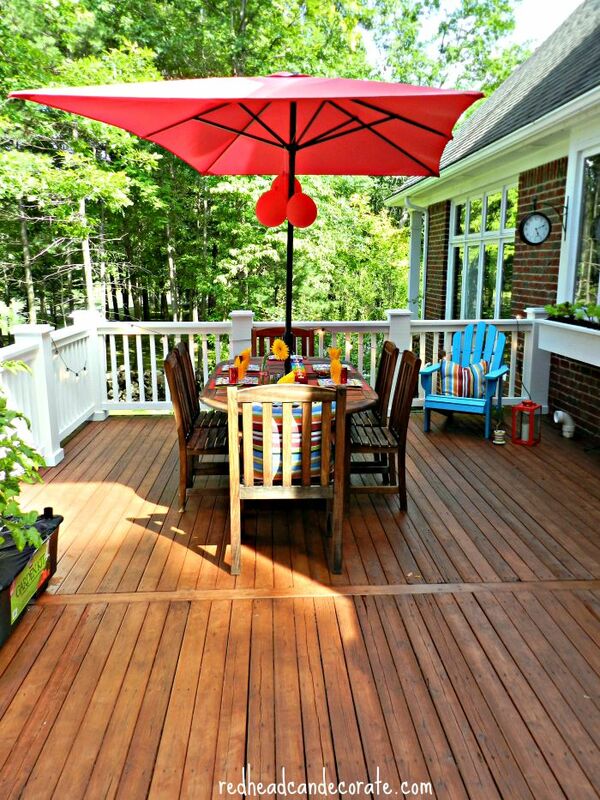 Your deck is stunning and I love the warm color that you used! I would spend all my time on that deck! Our little back deck could use some freshening up! I would stain my deck. Your husband did a great job on your deck. Your deck looks absolutely stunning…..we need to do this to our deck! 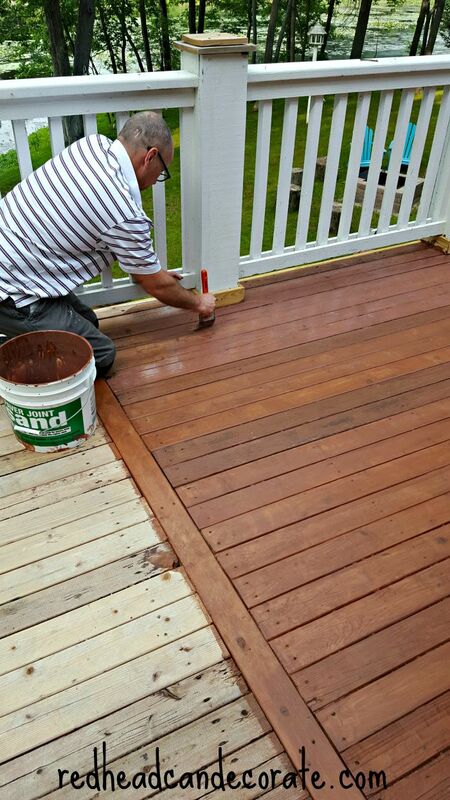 Rick did a bang-up job of fixing up your deck! He’s a cutie in your photos and looks almost like he’s enjoying himself! 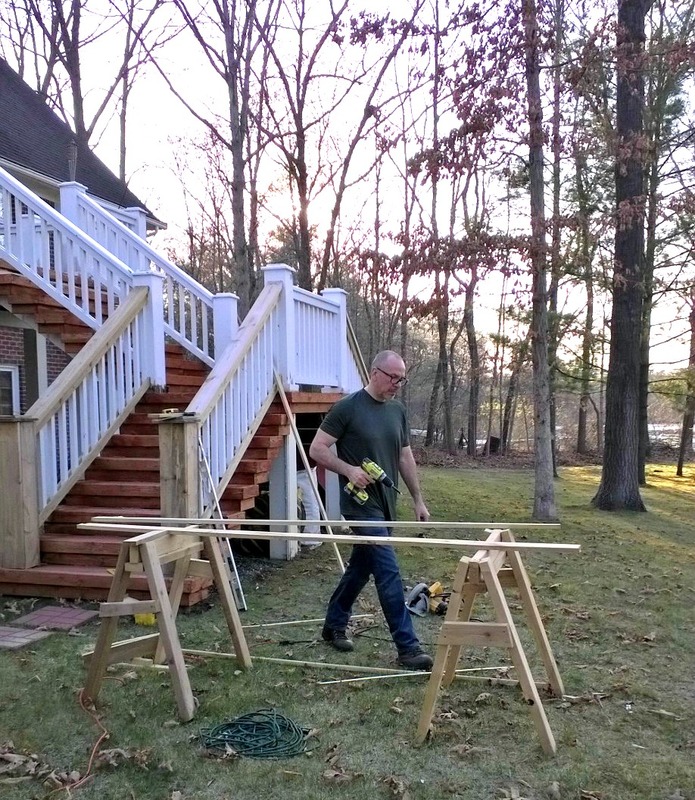 If I win the Thompson package, I’m going to hire Rick to work on our deck…I know how much work it is! Our 2 story deck is ready for a re-do, for sure. Kathy, this just made our night, lol!!! 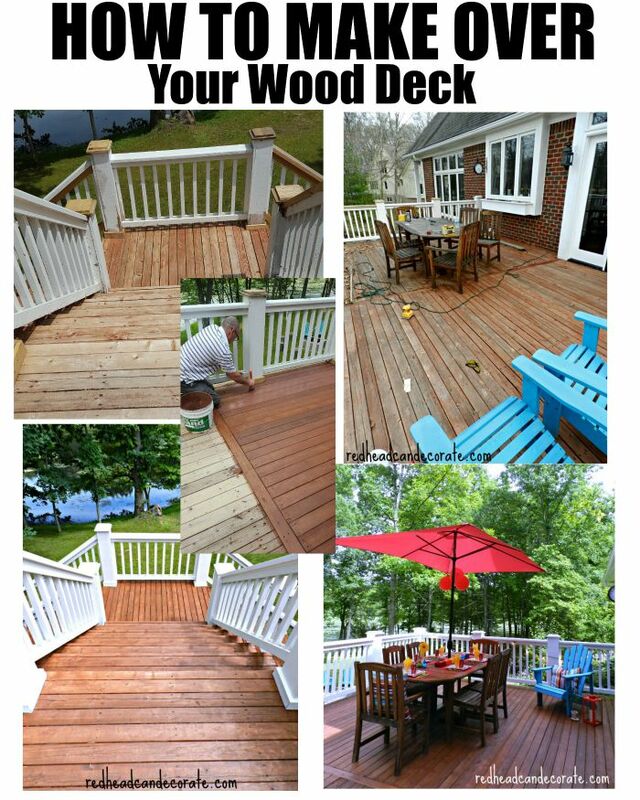 Your deck looks absolutely fabulous! What an awesome husband you have! Thanks for the instructions. What a project… but what GREAT results… looks amazing!!! This is just unbelievable…….I know a lot of work went into the job; it is truly beautiful!! Entertaining must be so much fun now. What a beautiful job and I am sure Thompson’s really made it all worth while.I am sure your husband is proud. My daughter just moved to a home on the beach with a deck that could use some work. I entered your giveaway but sorry, I don’t have an Instagram or Twitter account. Your deck turned out Beautiful! 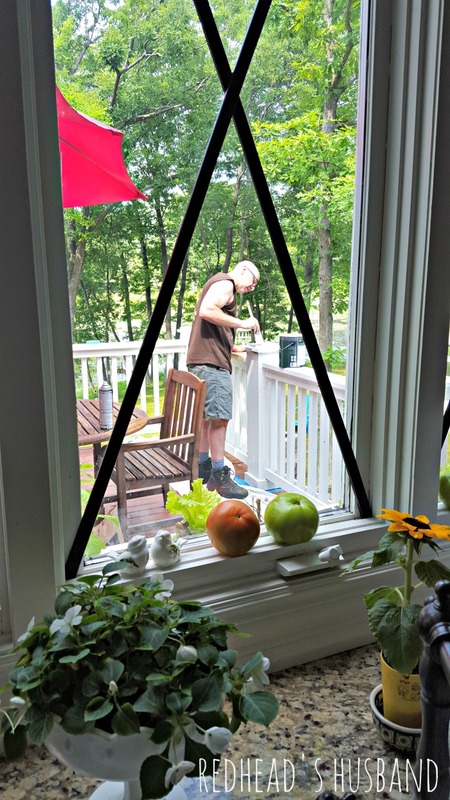 Thank You for sharing how to refinish decks. My deck could so use an uplift. It’s very nasty looking right now and moldy on the one side. This sure would help out in refinishing it. Thank You for the chance to win! Fingers crossed! Our deck is in terrible need of refinishing. We used Behr products and were very disappointed in the time that it took to wear off! Especially the area where we walk the most. Anxious to try Thompson’s products. Your outdoor space is beautiful and that view!! I had a deck built 1 1/2 years ago that has never been sealed. As a widowed Nanna of identical twin boys, other expenses have always taken priority. I would love to be able to seal my deck and bring the wood back to life. Julie…what an amazing deck transformation….in the past we have always used Thompson’s Water Seal….an amazing product….Great job…the deck is gorgeous….goes with your gorgeous view! My decks are in desperate need of help! Thompson’s to the rescue, please! home and are leaning towards staying but updating it. The deck seriously needs redoing, whether we stay or go. These products would help us either sell the house, or enjoy it if we stay! Thanks for the chance to win! would use it on the front and back porches. and on my daughter’s birdfeeders & drawer table! my deck is purple! Husband surprised me!!! Back deck put on 2 years ago …still have to get it treated ..this would help me immensely ! Looks great! Hope mine will end up looking as good as yours? Great Job! I know it’s a lot of work because my daughter & I did this to our deck (about 50 ft long with double steps) up in Mi when my husband took a new job in Ga. Great Products! would use it to do our shadow box fence. We have a covered patio with a lot of wood! Would love to win to give it a fresh new look! This is exactly what needs to be done at our kids house. I would love to win this and surprise them. Your desks look like new now. 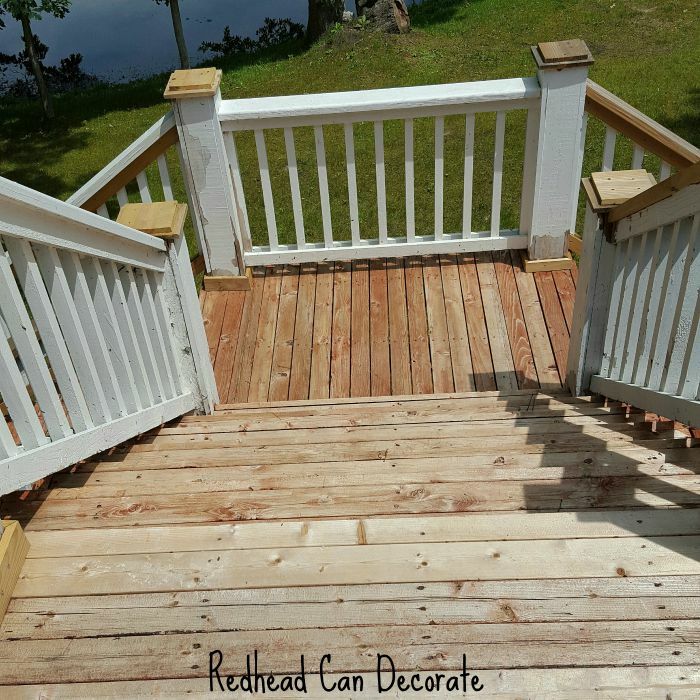 I redid my deck last year with another brand – it is very uneven looking and I was not impressed at all – Thompsons could make this single mother’s deck look fabulous!! My deck is pitiful looking, I need this!! Ohh…looks so good! My hubby and I desperatley need to refinish our deck! I would most definitely use Thompson’s WaterSeal to refinish our deck! Your deck turned out amazing! Our deck is in serious need of refinishing also. Wow Julie. You guys did a fantastic job. I wish could rescue my deck. We started stripping it last month and I am just sick. It looks terrible. We stopped just before Father’s Day and I am at loss to figure what to do next. Hopefully, we’ll get back to it soon or maybe we’ll just let the Chicago/Northwest Indiana winter snow cover it until next spring. I can look at your deck and dream about the possibilities. Thank you for this opportunity to win this deck make-over p ackage. Our deck is so-o-o sad! I started cleaning it with bleach and a scrub brush/broom last year. Do I need to say that that job is still not finished. So would really appreciate the Thompson’s Water Seal to finish our deck. 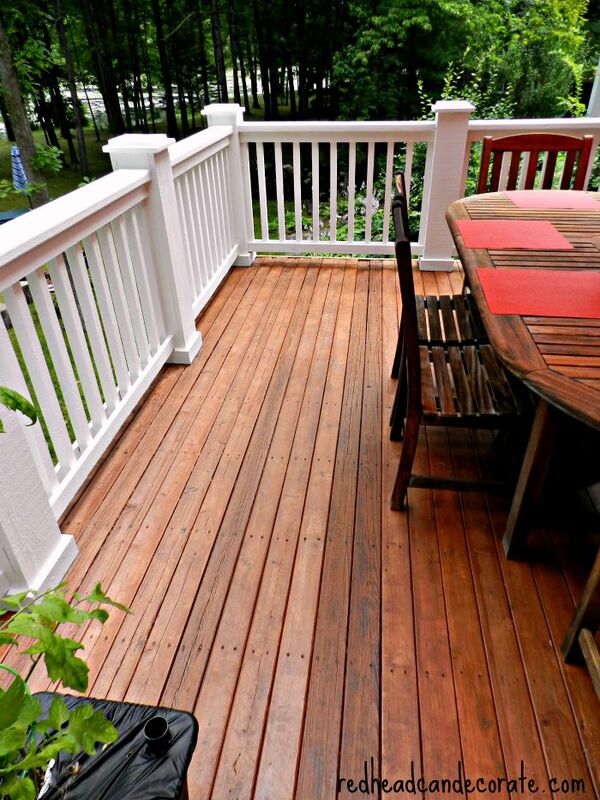 Your deck looks gorgeous — lots of work, but a big payoff. If I won, I’d give the products to my son. He’s planning to refinish his deck this summer. His deck is pounded with sun and rain every year. Good products like Thompson’s should help protect it. I so want to give that white stain a try. It looks so pretty on your railings. Great Job! We just bought our house had to tear off a HUGE deck because the person who built it didn’t put flashing or Tyvek behind the faceboard and used non-outdoor type plywood. It was completely rotted all the way to the insulation and drywall inside. We will be reusing the deck wood to rebuild a very small porch. The wood is gross and dirty because noone ever took care of it. This would DEFINITELY come in handy!! Our old deck is peeling and needs a good cleaning and restaining. Thanks for the chance to win. Your deck is gorgeous! I would love to try the Thompsons cleaner and sealant. I have a deck that has been flagged by the local code compliance because of peeling paint. It looks like this product might be what I need for my problem. I’m getting tired of painting it all the time. Thanks for the suggestion.